He was happy to pose for a picture! Singing puppy: "I Wanna Go Home"
It was hot enough today that I bought a hat and sat baking in the sun. People started closing up shop about 10:30 or 11 due to the heat. I definitely hope to bring an umbrella and/or cooler next week if the weather says hot again! Chris: You really should go to one, at least! Outdoor and indoor ones have entirely different 'feels' I've been to quite a few indoor ones in Minnesota, not many outdoor ones. How it works: You pay a small fee at the front gate to bring in merchandise (they waive it if you are giving away puppies or kittens, but not if you are selling them) If you're not selling, you park outside and walk in. 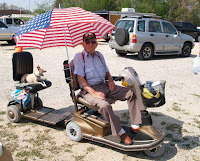 You go up and down the aisles (there are four at our flea market) and find a place to park your vehicle and set up shop. Some tables have prices on things, some you have to catch the person with the item you're interested in and ask them the price - then if you're comfortable doing it, haggle the price. Sometimes people come up with stuff and ask you to trade them something on your table for something from theirs. Anything you don't want to sell again you stick out of sight - or people WILL ask about it. Furniture and tools especially. I once had three offers to buy a table I had bought from another lot! When the traffic dies down, the tables and vehicles start getting packed up and put away - by noon the last car is usually gone. Food and animal vendors usually leave much earlier. 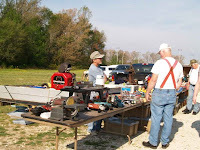 i love your flea market photos! flea markets rule. they are SO much fun. 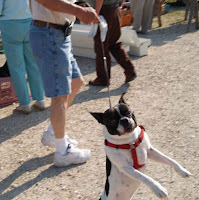 I probably should stay away from flea markets offering pets - I already have too many! I love flea markets! Yours looks brilliant :) I just bought some fantastic boxes for my knitting notions at a table top sale today. Hi! I live just east of Houston, and I have in-laws in Lexington. 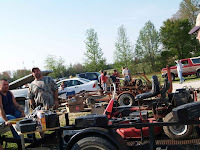 I try to never miss a Tuesday morning at the Huntingdon Flea Market when I am visiting! 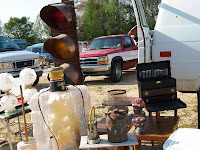 I love, love, love that flea market!!! The prices are WAY better than any to be found in the area I live in (TX), and so are the finds. Can't wait to go back in November!